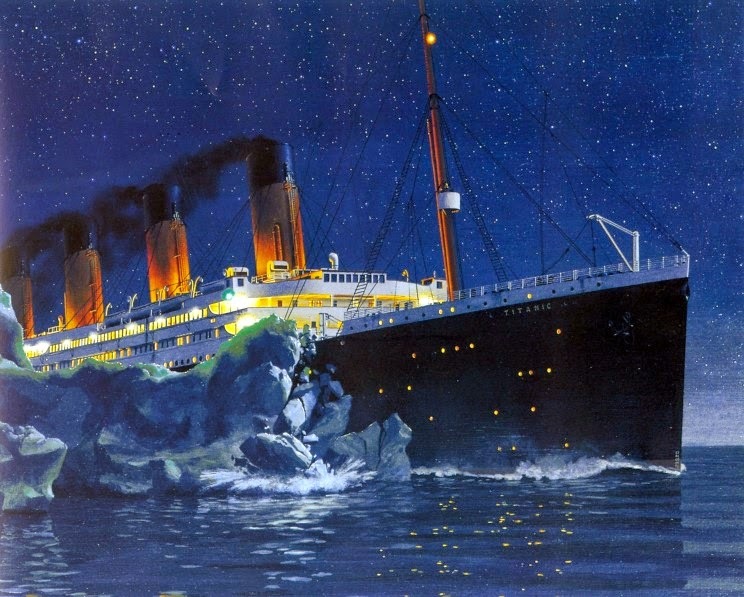 Titanic is cruising at 22.5 knots when Lookout Fredrick Fleet spots an iceberg directly in front of the ship. He immediately rings the crows nest bell three times. Then he telephones the bridge. Sixth Officer Moody answers the phone. Fleet responds, "Iceberg! Right ahead!" First Officer Murdoch watches as the iceberg approaches. First Officer Murdoch hears the 3 rings of the bell. He immediately spots the iceberg ahead and runs to the wheelhouse. He yells out an order to Quartermaster Hichens, "HARD-A-STARBOARD!" Hichens immediately turns the wheel to the left to steer the ship away from the iceberg. Then Murdoch telegraphs the engine room with the order "STOP... FULL SPEED ASTERN." Chief Engineer Bell and his crew frantically attempt to stop and reverse the engines. It is still not known if the crew had enough time to reverse the engines. Murdoch watches as the giant iceberg moves closer and closer. 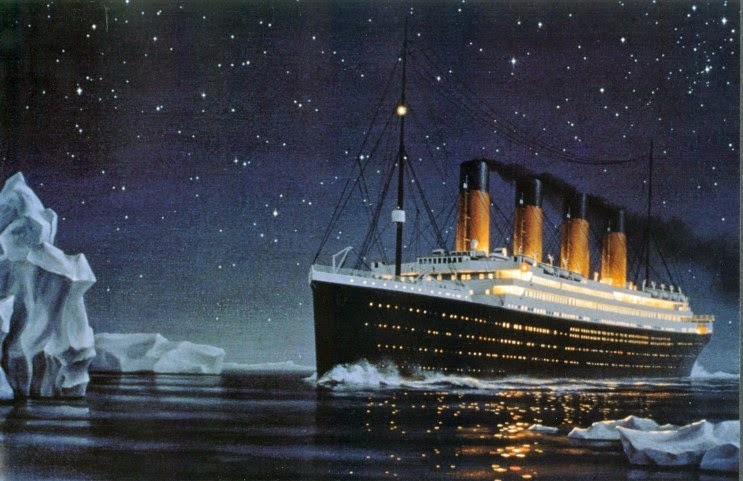 Titanic gradually turns to the left and the situation begins to look hopeful. Then there was a sudden vibration felt throughout the ship. Murdoch watches as the blueish colored berg scraped along Titanic's hull popping the iron rivets and bending the steel plates. Murdoch then closes the watertight doors to seal off the flooding compartments. Quartermaster Olliver steps onto the bridge just in time to see the peak of the iceberg pass by. Murdoch then yells out another order, "HARD-A-PORT!" By turning the ship in the other direction, he hopes to steer the rest of the length of the ship clear of the berg. The iceberg scrapes along 250 feet of Titanic's starboard side, fully exposing five of the forward watertight compartments and part of the sixth compartment to the sea. Down below, crewmen are desperately trying to find their way up and out of the flooding compartments. First class passengers on the promenade deck watch as the berg slowly passes by. Some claimed the iceberg closely resembled the shape of the rock of Gibraltar. The rest of Titanic clears the iceberg and the passengers on deck watch as the mountain of ice disappears into the night behind them.